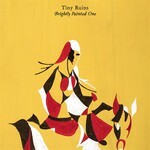 Brightly Painted One is Tiny Ruins' second album. Formed as a solo project in 2009 by songwriter Hollie Fullbrook, the band now includes bassist Cass Basil and drummer Alexander Freer. While still retaining a minimalist approach, this sophomore release is layered and shaped with an array of brass, percussion and strings. The arrangements are lush and fully-realized, with the warm fuzz of hammond and rhodes keyboards, subtle string parts and electric guitar jangles and thrums. Brightly Painted One was recorded with engineer Tom Healy over several months in an underground warren of passageways and small rooms known as 'The Lab', in Auckland, the band's hometown.